Acute tubulointerstitial nephritis and uveitis (TINU) syndrome is a rare disease, generally presenting in children and young women. The interstitial nephritis may precede, follow, or develop concurrent to the uveitis. We report the clinical features and outcomes of four adult patients, aged 41-70 years with the TINU syndrome. Acute tubulointerstitial nephritis and uveitis (TINU) syndrome is an uncommon oculorenal syndrome, first described by Dobrin in 1975, that remains a diagnosis of exclusion. Currently, only about 200 cases have been described in the literature. The pathogenesis of the TINU syndrome remains unclear. It is characterized by uveitis, tubulointerstitial nephritis (TIN), and marked general symptoms. It occurs predominantly in adolescent girls. The TINU syndrome is less well described in adults. Our objective is to describe the epidemiological, clinical, biological, and histological characteristics as well as treatment strategies and evolutive modalities in patients with the TINU syndrome. In this report, four adult patients with the TINU syndrome, admitted to the Internal Medicine Department of the Military Hospital of Tunisia between January 2006 and June 2012, are included in the study. The diagnosis of the TINU syndrome was made by the presence of ocular manifestations and acute interstitial nephritis (AIN) and after eliminating the other systemic, infectious, druginduced, and metabolic causes of AIN. For statistical analysis, Statistical Package for the Social Sciences (SPSS) software version 16.0 (SPSS Inc., Chicago, IL, USA) was used. Quantitative data were expressed as a mean ± standard deviation. As shown in [Table 1], there were four patients, two males and two females. The median age at onset was 54.8 ± 12.3 years (range 41-70 years). Past medical history was poor in two cases and showed hypothyroidism and ischemic cerebrovascular accident in one case each. General symptoms including fever, deterioration of general condition, and weight loss were noted in, respectively one, two, and three cases. Anorexia, abdominal or flank pain, and arthralgias were found in two cases. The interstitial nephritis preceded uveitis in one case but followed ocular manifestations in three other cases, and none of the patients developed TIN concurrent with uveitis. The renal manifestations included proteinuria and renal glycosuria in one case each. Oligoanuria was not noted in any our patients. Redness of the eye and blurred vision were observed, respectively, in two and one patients. Ocular involvement included anterior uveitis in three cases; it was bilateral in two patients and unilateral in the other. Episcleritis was seen in the fourth patient. Table 1. Demographic and clinical features in the four patients with the acute tubulointerstitial nephritis and uveitis syndrome. All patients had an acute renal injury with mean blood urea nitrogen of 13 ± 8.3 mmol/L and mean serum creatinine of 274.5 ± 171.3 μmol/L. The plasma antinuclear cytoplasmic antibodies (ANCA) were positive at a level of 1/80 in one patient. Laboratory characteristics of our patients are mentioned in [Table 2]. An ultrasonography of the kidney was performed in all cases and was unremarkable in all. Table 2. Laboratory features in the four patients with the acute tubulointerstitial nephritis and uveitis syndrome. Renal biopsy was performed in one case because of unexplained acute renal injury. It was consistent with TIN and showed dense renal interstitial infiltration with lymphocytes, plasma cells, and neutrophils. Interstitial fibrosis, eosinophils, granulomas, and signs of vasculitis were absent. Glomerular and vascular structures were preserved ([Figure 1] and [Figure 2]). Immunofluorescence was negative for complement fractions and immunoglobulin A, G, and M at the tubular level. Figure 1. Renal biopsy showing inflammatory interstitial infiltration. Figure 2. 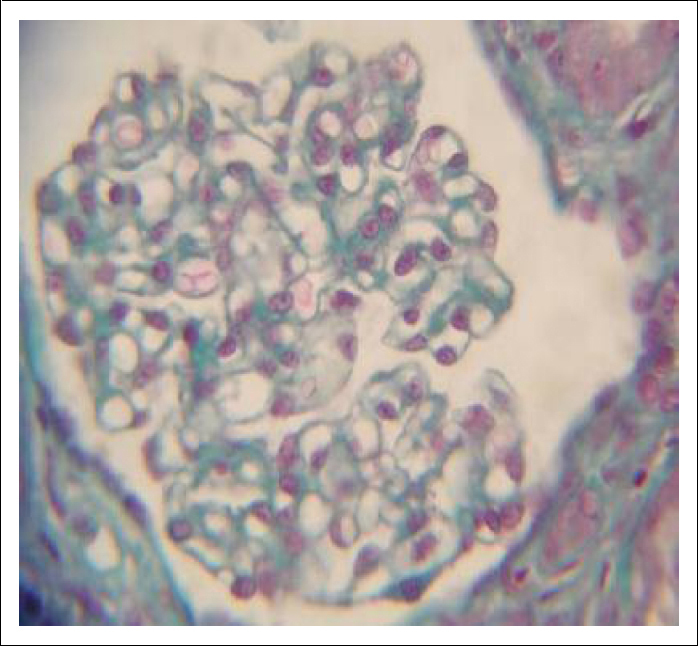 Renal biopsy showing normal glomerulus. Investigations failed to reveal systemic or infectious diseases in the study cases, and the diagnosis of TINU syndrome was made. All patients initially received local corticosteroid treatment for uveitis. One patient relapsed after six months. Oral corticosteroid therapy (0.5-1 mg/kg per day) was started at the onset of renal symptoms with progressive reduction over an average of five months. Only one patient received immunosuppressive therapy because of poor visual prognosis due to the presence of hyalitis. The evolution of renal manifestations was favorable in all our patients. Complete renal recovery with normal renal function and proteinuria under 0.5 g/24 h was observed in all cases. Four cases of the TINU syndrome are reported with the following peculiarities: absence of female predominance (2 males and 2 females), occurrence in adult patients, and, in one case, ocular manifestations occurred after acute renal injury and were in the form of episcleritis in one case and uveitis in three cases. The TINU syndrome is reportedly three times more common in women than in men, with a median age at onset of 15 years (range: 9-74 years). The median age of our patients was 54.8 ± 12.3 years, and there was no female predominance in our series. It is an uncommon disease; symptoms are related to both uveitis and interstitial nephritis. The general symptoms associated with TINU include fever (53%), weight loss (47%), general weakness and malaise (44%), and anorexia (28%). , The general symptoms noted in our series were fever, deterioration of general condition, and weight loss. In most cases (65%), nephritis precedes uveitis; however, in 21% of cases, uveitis is present before nephritis, and in 15%, the two conditions occur simultaneously. In our series, in 75% of cases, uveitis preceded the nephritis. Symptoms associated with nephritis are typical of AIN such as flank pain, pyuria (mainly sterile), hematuria, and proteinuria, which is less severe than that seen with nephrotic syndrome. Renal failure could also occur and may be acute or chronic. The ocular manifestation is in the form of anterior uveitis in 80% of patients but may also manifest as posterior or panuveitis. A case of nodular scleritis preceding TINU syndrome in adult was described in 2006. In our series, three cases had uveitis and one patient had episcleritis. Episcleritis may be part of the possible spectrum of ocular inflammation occurring in TINU syndrome. TINU syndrome might be underdiagnosed due to lack of recognition. Mandeville et al in 2001 have been the only group to date to publish evaluation criteria for the TINU syndrome. In our series, three patients had a definite TINU syndrome and one had a possible TINU syndrome (the patient who had episcleritis). However, he was considered to have TINU syndrome because all the differential diagnoses were eliminated. The differential diagnoses of TINU include sarcoidosis, Sjogren's syndrome, Behcet's disease, Wegener's granulomatosis, systemic lupus erythematosus, hyperthyroidism, primary hyperparathyroidism, and infectious diseases (e.g., tuberculosis, brucellosis, toxoplasmosis, and herpes). The TINU syndrome has been reported to be associated with infection, drugs or autoimmune diseases. However, it is mostly postulated to be the result of an autoimmune process. It likely involves an autoimmune reaction against constituents common to the renal tubulointerstitium and uveal tract. The TINU syndrome has been associated with the presence of anti-nuclear antibody and, ANCA, an autoantibody directed against renal tubular cells, rheumatoid factor, and hypocomplementemia. Various clinical findings and laboratory results could be helpful in making the diagnosis. β2 microglobulin and Krebs von den Lunge - 6 (KL-6) protein have been reported as two potential diagnostic markers in the TINU syndrome. Urinary β2 microglobulin level, a marker of interstitial nephritis, was markedly elevated in almost every case tested and may remain elevated for months after the urinalysis and serum creatinine have returned to normal. It may be useful in cases where renal biopsy is not indicated. KL-6 is a glycoprotein whose serum concentrations rise in response to various respiratory pathologies. Compared to patients with uveitis from other causes, serum KL-6 levels were significantly elevated in patients with the TINU syndrome and on renal biopsy, the distal tubules of patients with the TINU syndrome stained strongly with anti-KL-6 antibody suggesting that the elevated KL-6 levels reflect the underlying renal lesion. Serum KL-6 levels may prove to be a valuable tool in the diagnosis and follow-up of patients with the TINU syndrome, especially if studies show a significant difference between patients with TINU syndrome compared with AIN of other etiology. There are no prospective, randomized clinical trials available regarding the treatment of TINU. TIN can resolve spontaneously, and dialysis therapy is generally not required. In cases with progressive renal impairment, oral prednisolone, started at 1 mg/kg/day, is usually recommended. The anterior uveitis of TINU syndrome has been treated most commonly with topical corticosteroids and cycloplegic agents. Uveitis in the setting of TINU syndrome appears to be more persistent and troublesome than the nephritis. Immunomodulatory chemotherapeutic agents may be used when uveitis is unresponsive to systemic steroids or to reduce ocular or systemic toxicity from corticosteroids. The agents used include azathioprine, methotrexate, cyclosporine, and mycophenolate mofetil. , In our cases, only one patient required immunosuppressive therapy because of an ocular relapse with hyalitis. TINU is often not recognized and affected patients often fail to seek medical care, making the prevalence of the disease appear less than in actuality. TINU syndrome should be considered in the differential diagnosis of unexplained TIN, especially in the presence of ocular findings. The ophthalmic and renal prognosis of this syndrome seems favorable with corticosteroid treatment. The oculorenal syndrome or TINU syndrome is probably of immunological origin. It comprises unilateral or bilateral anterior uveitis, which may follow, concur with, or even precede renal failure and is most frequently seen in children and adult females but can occur at any age, even in the elderly. The prevalence of this syndrome is probably underestimated, and therefore, physicians, especially pediatricians, nephrologists, rheumatologists, and ophthalmologists, who are likely to see such patients should be familiar with TINU syndrome to recognize and properly diagnose and treat this condition. Dobrin RS, Vernier RL, Fish AL. Acute eosinophilic interstitial nephritis and renal failure with bone marrow-lymph node granulomas and anterior uveitis. A new syndrome. Am J Med 1975;59:325-33. Tan Y, Yu F, Zhao MH. Autoimmunity of patients with TINU syndrome. Hong Kong J Nephrol 2011;13:46-50. Andrew TN, Mangos GJ, Chan YL. Tubulointerstitial nephritis and uveitis: A rare cause of renal failure. Hong Kong J Nephrol 2002; 4:105-7. Mandeville JT, Levinson RD, Holland GN. The tubulointerstitial nephritis and uveitis syndrome. Surv Ophthalmol 2001;46:195-208. Thomassen VH, Ring T, Thaarup J, Baggesen K. Tubulointerstitial nephritis and uveitis (TINU) syndrome: a case report and review of the literature. Acta Ophthalmol 2009;87:676-9. Kadanoff R, Lipps B, Khanna A, Hou S. Tubulointerstitial Nephritis with Uveitis (TINU): A syndrome rheumatologists should recognize: A case report and review of the literature. J Clin Rheumatol 2004;10:25-7. Daniel E, Gangaputra S, Kempen JH, Jabs DA. Recurrent nodular scleritis preceding an adult TINU syndrome. Ocul Immunol Inflamm 2006;14:239-40. Paladini A, Venturoli V, Mosconi G, Zambianchi L, Serra L, Valletta E. Tubulointerstitial nephritis and uveitis syndrome in a twelve-year-old girl. Case Rep Pediatr 2013; 2013:652043. Parameswaran S, Mittal N, Joshi K, et al. 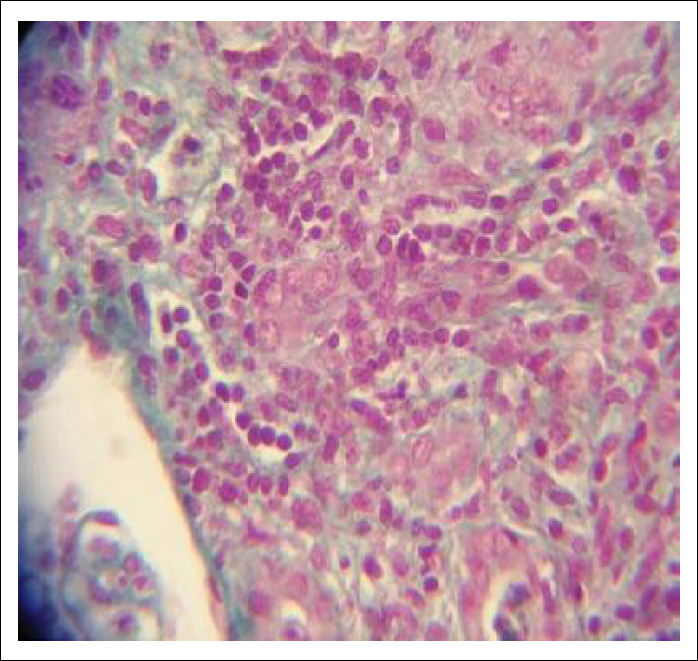 Tubulointerstitial nephritis with uveitis syndrome: A case report and review of literature. Indian J Nephrol 2010;20:103-5. Liakopoulos V, Ioannidis I, Zengos N, et al. Tubulointerstitial nephritis and uveitis (TINU) syndrome in a 52-year-old female: a case report and review of the literature. Ren Fail 2006;28:355-9.